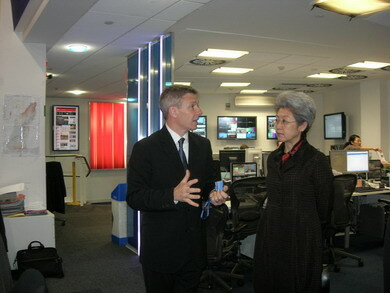 On November 19, Ambassador Fu Ying visited the headquarters of Sky News at its invitation. 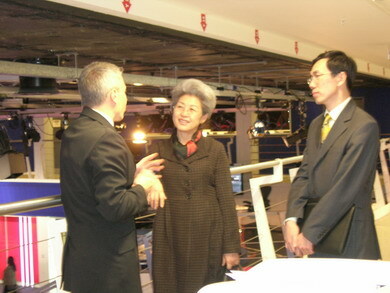 She toured around the studio hall and news editing room, listened to the introduction on the channel’s organizational structure and operating model made by Adrian Wells, director of international news department and held discussions with Head of Sky News John Ryley and foreign affairs director Tim Marshall. Fu Ying said, we are glad to read on the UK media an increasing number of expansive, in-depth and unbiased coverage on China. Admittedly, however, the West has not broken its wall of bias against China despite the collapse of the Berlin Wall. That has affected the image and credit of the West among the Chinese people and in particular, caused resentment among the young Chinese. The Western media is to blame on this. Such resentment was further reinforced by the recent speculative reports on unrelated topics rather than important agreements reached between the two countries during President Obama’s visit to China. It is important that the Western media understand more about China and be responsible in covering the diversity and complexity of a modern China in a fair and objective way. Fu Ying said, human rights are high on the government’s agenda. The Government is also committed to improving the life of its people. Human rights protection has been written into the Constitution. Sustained progress on human rights is evident to all. The Government is committed to advancing socialist democracy. Laws and regulations are adopted after thorough field studies and extensive public consultation. Complaint channels are in place within governments of different levels, making possible proper settlement for most cases. However, as reform and open-up is yet to be fully accomplished, there are still difficulties and challenges as well as flaws and problems which China is working to resolve. Ryley said, the release of the Administrative Regulations Governing Foreign Journalists and Resident Foreign News Agencies and Ordinance on Information Disclosure and more frequent contacts with the Western media with candid exchange of views have proven that China is more open and transparent. The Western media should reflect on the negative impression it has left on the Chinese public. They should know more about China and avoid any hasty conclusions. More interviews in China and convenience for foreign journalists can help the Western media understand China better and transmit information on China through the media platform. Sky News takes China report seriously and is ready to make greater contribution to melting the wall between China and the West. Fu Ying and the host exchanged views on issues such as China’s international status, China-US relationship, China-Africa relationship, the Iranian nuclear issue and Afghanistan issue. Founded in February 1989, Sky News is an independent TV channel under BSKYB and was the first in Europe to broadcast 24-hour international news. Known for its coverage of unexpected events, it also makes news programmes for BBC Channel Five and over 30 broadcasting and TV stations. It attracts 14 million audience in total.